Kids usually loves dates, but I believe they will get bored if you serve them only dates every day. 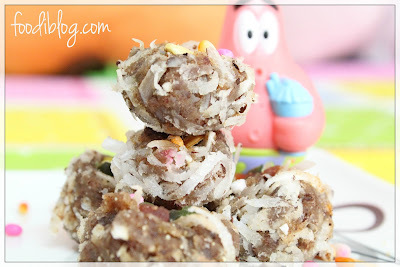 So here I penned down a Healthy recipe Coconut Dates balls which kids cant resist. 1. Cut dates in small pieces and boil them in 1/2 cup of water till they become soft. Drain through sieve and allow them to cool. 2. Crush them with your palms ALTERNATELY grind them if you dont like big pieces of dates. 2. 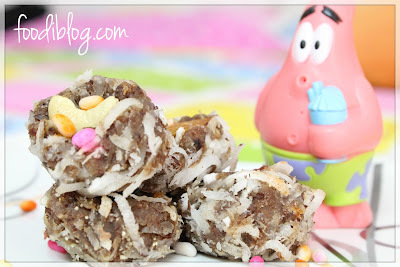 Add milk powder and coconut to crushed dates mixture and mix it well. 3. Mix 1/2 tbsp coconut and cocoa powder in a separate plate. 4. Make small small balls from dates mixture and rub them with coconut cocoa mixture. 5. Decorate them as you like and serve.